We see them in the grocery stores; the brightly colored seasonal boxes with cakes and cupcakes that make your mouth water. For some of us there’s a voice in our head that says, “But it’s a box mix!” and that means artificial flavor and color, and therefore a lack of quality that we might have become accustomed to. And then there’s the rest of us who say, “OMG those would be perfect for that picnic, cookout, or potluck we’re going to this summer!” knowing that the summer months are going to be busy and we just need something easy. I’m a mixture of both. As much as I crave a nice, gourmet quality cupcake, I haven’t outgrown my roots in boxed cake mixes. 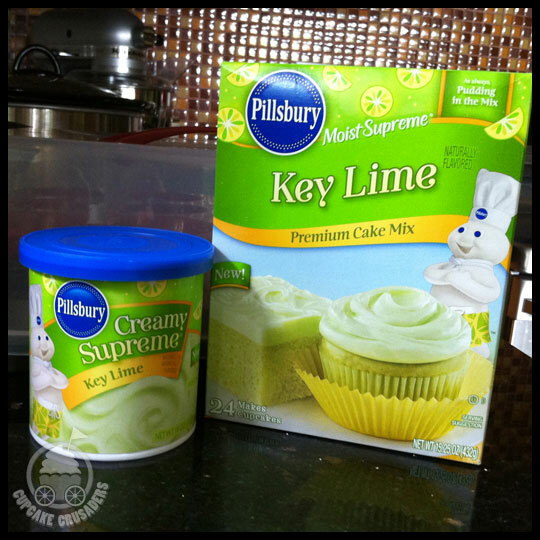 So, succumbing to the bright summer colors, I bought Pillsbury’s Key Lime cake mix and frosting (as well as their Pink Lemonade, which is still in my pantry — you may remember that we also tried their Orange Creamsicle earlier this season). I battled with the urge to doctor up the cake and frosting, to customize them in some way. I originally wanted to pipe the frosting, but knew that I wouldn’t have enough in the tub for two dozen, and it wouldn’t set properly. And I really wanted to be able to give you an honest review of what you get straight from the box. My solution? To make a homemade white chocolate ganache filling. For the filling I used white chocolate chips and, instead of butter (which can discolor the white chocolate) or heavy cream (which I just didn’t have), I used 2% milk. I had to let the ganache cool first because it was too runny when warm, but it worked beautifully even with milk. I kept the decoration simple and the frosting minimal since it’s so sweet. Topped with some shaved white chocolate pieces, I was pleasantly surprised with how pretty they were in the end! The cake and frosting were both tangy, but there was definitely an unmistakable “fake-ness” to the key lime flavor. It actually made my tongue tingle a little (like when you eat too many Pixie Sticks or sour candies…I know I’m not alone here, right?!). But the cake was super moist and fluffy, one of the reasons I come back to box mixes time and time again. The white chocolate was the PERFECT pairing for this cupcake. It brought down the artificial tang (and tingle), and added that custom, high-end quality I was looking for. I brought the cupcakes to my calligraphy guild’s pre-summer social. There were so many treats, all homemade of course. My cupcakes looked amazing, but the real test was: How would they stand-up to these people who clearly appreciate family recipes? Well, people literally gawked when I told them it was a box mix. So, they either agreed with me and the white chocolate ganache added the needed pizazz, or they just aren’t as picky as I worried they might be. Either way, if you are in a bind and need a quick dessert this summer, I think you’ll be safe picking up this box mix. 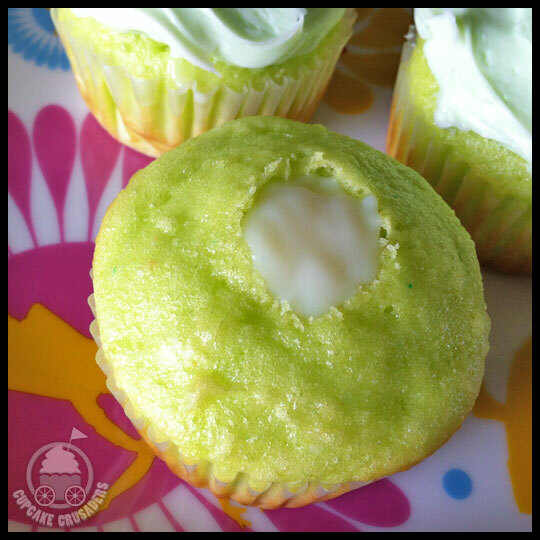 This entry was posted in Baking, Cupcakes and tagged Box Mix, ganache, key lime, lime, Pillsbury, seasonal, Summer, white chocoalte by Crusader Jenn. Bookmark the permalink. Whenever I buy limes at the grocery store for a family recipe that can only be made maybe twice a year, people think I’m making key lime pie. Limes in February, people always ask what I’m doing with them. LOL. 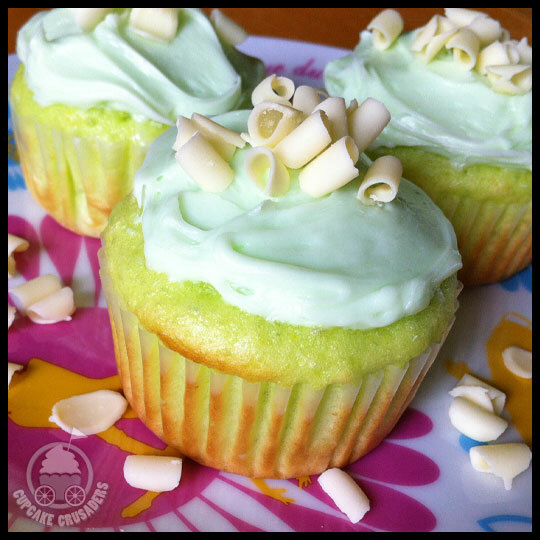 It’s a very hard flavor to nail with cupcakes and cake, and we’ve all tasted a nasty key lime pie more than once. Like you, I love the gourmet cupcakes, but I also know a really moist, fluffy cupcake or cake can come out of a box if I’m pinched for time, or don’t want to be disappointed by an unfamiliar bakery. You definitely went creative with the ganache, which I think gave it a unique twist. All in all, excellent review. I never would have thought of the ganache! I have an author pal that uses boxed cake mixes for cookies whenever he does signings and they’re immense hits. He’s sticking to some pretty fun ones though, nothing too complicated. He jazzes them up with fruit, nuts, and candy and people go crazy for them. I don’t think there will ever be a time when people shy away from boxed mixes. They’re convenient, don’t take up a ton of time, and they bake quickly. I prefer mixes more with brownies and I jazz them up with nuts and liquor, especially during the Winter months. It’s hard to screw things up when everything is premeasured for you, etc. I think you all do an AMAZING job on the web-site. I love checking out your recipes and reviews. Jenn…these are really pretty! Love you!